I had the opportunity to hear Jake Adams (coralidea & fishidea) present his college studies on the importance of flow in the aquarium for the third time last night at the Marine Aquarist Roundtable of Sacramento's November meeting. The other times I heard this talk was at MAX (Marine Aquarium Expo) and Reef-a-palooza, both at the Orange County Fairgrounds, 2008. And not to be too judgmental about the other location, it sure was nice to hear Jake's presentation in an environment that was not so loud and distracting. There was a lot of buzz going around the MARS website and their Reef Central hosted forum about Jake's upcoming presentation and over 70 of the 115 club members showed up to listen to his wisdom. He really laid it down and presented qualified proof that aquarium flow is vitally important to the growth and success of a reef aquarium. To hear Jake's talk click HERE and use the link in the player bar in the upper right. To download and save to your computer, click HERE and use the links on the left of the archive.org page to save the zip file. Here is a link to an Advanced Aquarist Online Magazine article that shows many of the graphs that Jake speaks about in this presentation. Jake will be speaking again tomorrow, November 23, 2008 at the Bay Area Marine Aquarium Conference (BAYMAC) in San Jose, organized by Gresham Hendee. 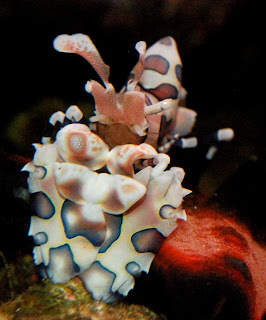 Without a doubt the Harlequin Shrimp is one of the most fascinating animals available to reef enthusiasts. The Harlequin is also called the "Painted Dancing Shrimp". But what comes with such beauty is the all so common high maintenance requirements. 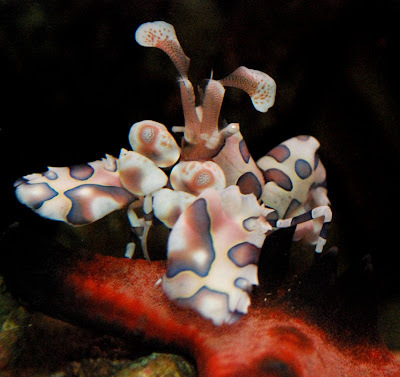 The Harlequin Shrimp is a full time preyer. And the only thing they will eat are starfish. I recently purchased a pair of Harlequins to maintain a recent out burst of Asterinas rubens stars in the Barton Memorial Hospital's Family Physician Office reef tank. The Asterinas are a common nuisance in reef aquariums. The Harlequin Shrimp like aquariums that are moderately lit. Dining on echinoderms, primarily starfish, it may also pick at urchins. Will eat most Linckia species, the Harlequin shrimp tends to leave Fromia sp. alone unless it is very hungry and it`s the only type of starfish in the tank. Keeping several starfish in the tank will enable a careful Harlequin shrimp to tend to it`s `herd` and only eat the starfish bit by bit. This enables the starfish to go free and heal as the Harlequin selects a different seastar.